Major General (Retd.) 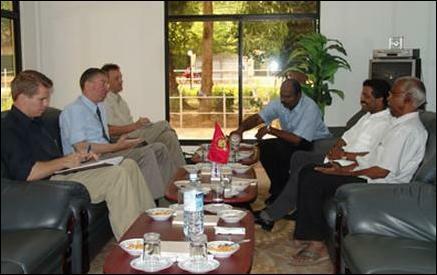 Trond Furuhovde, Head of the Sri Lanka Monitoring Mission (SLMM) met with Head of LTTE Political Wing, S.P.Thamilchelvan in the Peace Secretariat building in Kilinochchi Sunday, LTTE's website said. Director of the Peace Secretariat, Pulithevan, accompanied Mr. Thamilchelvan for the discussions. Matters related to the Cease Fire Agreement (CFA), continuing violence in Batticaloa and Amparai, and the general political situation of Sri Lanka were discussed during the meeting according to the website.